Description: This is a 5-piece put-together, take-apart Original Little People playset. 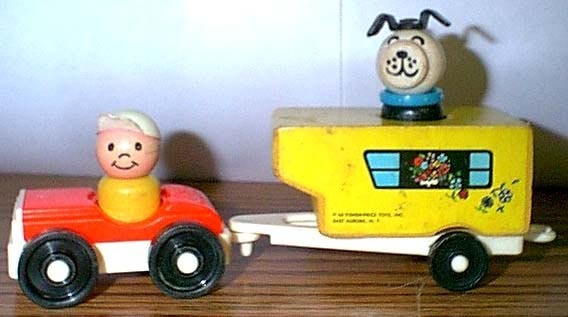 The set includes a car, a small wooden camper, a trailor, and two Little People figures. Eventhough this set was made for only 3 years, there are quite a few variations among the 5 pieces. The car is a decandant of the cars used in 1963-1965's #932 Amusement Park, except the car used in this set has larger wheels, and a c-shaped trailor hitch on the back to pull the accessory trailor. In 1968 the car had a metal rivet through the bottom, but it didn't in 1969 or 1970. In addition, the car color varies. The trailor could be either red or white. The wooden camper has 2 holes in the bottom to stay attached to the trailor. Variations also exist among the figures. FPT867 - Red top, white base garage style car. This car has a C-HOOK on the back and TWO metal rivets on the bottom. 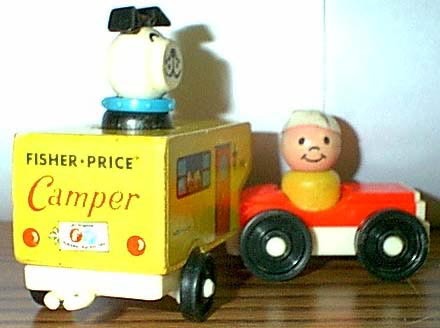 The car is marked "fp" and "Fisher-Price Toys" on the TRUNK lid, has NO gas hole, and rolls on black 7/8" dia. wheels that are marked "Fisher-Price Toys". The wheels are held on via white plastic axles. *See "Variations" below. FPT680 - Solid wood camper (about the size of a fist) that has yellow lithos on the sides with camper windows. 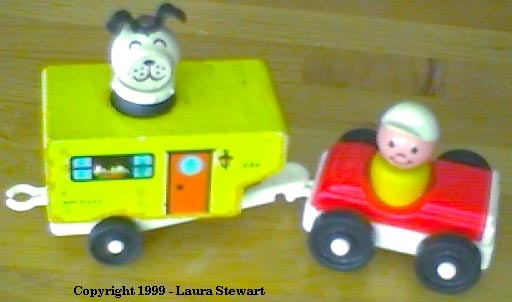 The top of the trailor has a hole for a Little People figure to ride along. The bottom of the camper has 2 holes that fit on the trailor (this keeps the camper from sliding off of the trailor). EQWW - Yellow straight-sided boy with a recessed "belt" on his base about 6mm from the bottom, a smiling face, and wearing a blue front-facing baseball cap. HRWW - Black straight-sided Lucky dog wearing a white collar. The collar has dots on the outside edge. This set was sold in a 6-1/2" x 3-3/8" x 2" display box. 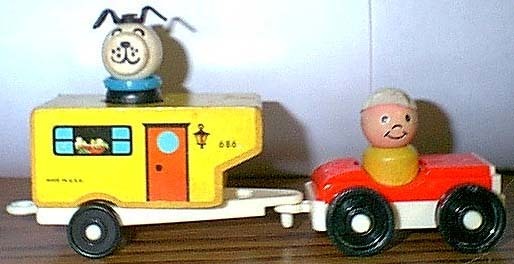 This set uses the same car, hitch and people types as 1968's #685 Play Family Car and Boat.